The diverse mix has built a city with an unrivalled tradition of jazz and blues, an astonishing architecture, an appetite for hearty food, award-winning newspapers, universities full of Nobel laureates and some of the most die-hard sports fans you'll ever meet. The city has the lot: itinerant artists babbling Beat, Polish aunties stuffing sausage, African-American mothers organising the block, blue-collar guys bad-mouthing the Bears, a crooner singing the blues on the South Side. It's a city that wears its American heart proudly on its sleeve. On a cold windy day in Chicago, when the temperature's subzero and strong gusts stop you in your tracks, the first question that will come to mind is, 'Who the hell decided to build a city and settle here?' Well, nearly three million hardy souls now call this great city home, and they can thank the mettle and vision of their Irish, Italian, German, Polish, Mexican and Asian immigrant forebears, and others who migrated here from the southern US for creating it. No one is sure when Native Americans first lived in the Chicago region, but evidence can be traced back 10,000 years. By the late 1600s, there were many tribes in the region, the dominant one being the Potawatomi Indians. In 1673 Marquette and Jolliet explored the Chicago River and Lake Michigan as they traveled through the Midwest Region. In 1779 Jean Baptist Point Dusable built the first settlement on the land that is now Chicago. The two learned that the Indians of the region called the area around the mouth of the river 'Checaugou,' after the wild garlic (some say onions) growing there. After the Revolutionary War, the US increasingly focused attention on its vast western frontier. A settlement had been established on the north bank of the river by the fur trader Jean Baptiste Point du Sable in 1779. The position on Lake Michigan suited the government's plan to create a permanent presence in the area, and in 1803 Fort Dearborn was built on the south bank of the Chicago River. In the 1800's, Fort Dearborn was built and was burned by Indians. The Black Hawk War was fought and Chief Black Hawk died. Chicago became a city and the Great Chicago Fire occured. The Illinois and Michigan canal was finished through the old Indian portage. Chicago's first elevated lines were completed. The first skyscraper was built. The Columbian Exposition was held in Chicago. 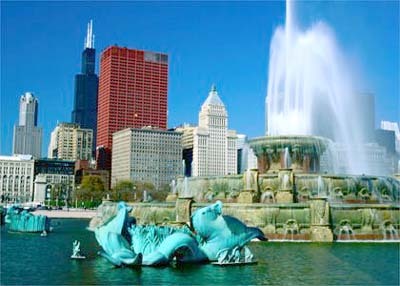 Chicago was incorporated as a town in 1833, with a population of 340. Within three years, land speculation rocked the local real estate market; lots that had sold for 33.00 in 1829 went for 100000.00. The boom was fuelled by the start of construction on the Illinois & Michigan Canal, an inland waterway linking the Great Lakes to the Illinois River and thus to the Mississippi River and New Orleans. The swarms of labourers drawn by the canal construction swelled Chicago's population. The canal opened in 1848, and commercial ships began to ply the Chicago River from the Caribbean to New York. One of the city's great financial institutions, the Chicago Board of Trade, opened to handle the sale of grain by Illinois farmers, who had greatly improved access to Eastern markets thanks to the canal. Railroad construction absorbed workers freed from canal construction. By 1850, a line had been completed to serve grain farmers between Chicago and Galena, in western Illinois. A year later, the city gave the Illinois Central Railroad land for its tracks south of the city. It was the first land-grant railroad and was joined by many others, whose tracks eventually would radiate out from Chicago. The city quickly became the hub of America's freight and passenger trains, a status it would hold for the next hundred years. Like other northern cities, Chicago profited from the Civil War, which boosted business in its burgeoning steel and tool-making industries and provided plenty of freight for the railroads and canal. In 1865, the year the war ended, an event took place that would profoundly affect the city for the next hundred years: the Union Stockyards opened on the South Side, unifying disparate meat operations scattered about the city. Chicago's rail network and the development of the iced refrigerator car meant that meat could be shipped east to New York, spurring the industry's consolidation. The summer of 1871 was very dry, leaving the ground parched and the wooden city vulnerable. On Sunday evening, October 8, 1871, just after nine o'clock, a fire broke out in the barn behind the home of Patrick and Catherine O'Leary at 13 DeKoven Street. How the fire started is still unknown today, but an O'Leary cow often gets the credit. Although the cause is now debated, the results were devastating. The fire burned for three days, killing 300 people, destroying 18,000 buildings and leaving 90,000 people homeless. 'By morning 100,000 people will be without food and shelter. Can you help us?' was the message sent east by Mayor Roswell B Mason as Chicago and City Hall literally burned down around him. Mayor Mason earned kudos for his skillful handling of Chicago's recovery. His best move was to prevent the aldermen on the city council from getting their hands on the millions of dollars in relief funds that Easterners had donated after the mayor's fireside plea, thus ensuring that the money actually reached the people living in the rubble. By the turn of the century, Chicago's population had swelled to almost two million. In 1933, Ed Kelly became mayor. He strengthened the Democratic Party in the city, creating the legendary 'machine' that would control local politics for the next 50 years. Politicians doled out thousands of city jobs to people who worked hard to make sure their patrons were reelected. The zenith of the machine's power began with the election of Richard J Daley in 1955. Daley was reelected mayor five times before dying in office in 1976. With an uncanny understanding of machine politics, he dominated the city in a way no mayor had before or since. In 1971, the last of the Chicago stockyards closed. Elsewhere in the city, factories and steel mills closed as companies moved to the suburbs or the southern US, where taxes and wages were lower. A decade of economic upheaval saw much of Chicago's industrial base erode. But two events happened in the 1970s that were harbingers of the city's future. The world's tallest building (at the time), the Sears Tower, opened in the Loop in 1974, beginning a development trend that would spur the creation of thousands of high-paying jobs in finance, law and other areas. And in 1975 the Water Tower Place shopping mall opened downtown and developers began to realize that the urban environment was an attraction in itself. In the fall of 1982, a Who's Who of black Chicago gathered to propel Harold Washington, Chicago's first African American mayor - and a reformist, to boot - into office. Much of the political and social chaos that marked the years from 1983 to 1987 had ugly racial overtones, but at the heart of the conflict was the old guard refusing to cede any power or patronage to the reform-minded mayor. The irony is that when Washington died, seven months after he was reelected in 1987, he and his allies were just beginning to enjoy the same spoils of the machine they had once battled. In 1989, Chicago elected as mayor Richard M Daley, the son of Richard J Daley. Like his father, Daley has an uncanny instinct for city politics. Unlike his father, he has shown much more political savvy in uniting disparate political forces. Daley has moved to solidify his control of the city in a way his father would have applauded, but in a much more enlightened manner. The parks are much cleaner and safer, and the schools - recently the worst in the nation - are showing signs of marked improvement. A new generation of professionals is discovering the joys of urban living, among them Chicago's vibrant cultural and social scene. Billions of dollars in private investment have flowed to neighbourhoods, and the city's diversified economic base enabled it to weather recessions and terrorism threats with aplomb. In 2003, Chicago handed Mayor Daley his fifth election victory in yet another landslide.